Why Have Your Home Professionally Air Sealed? 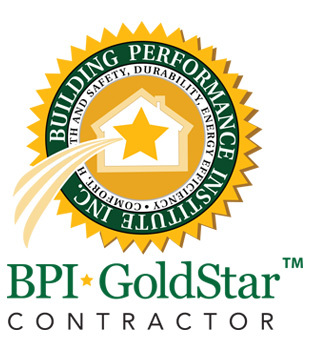 The Building Performance Industry (BPI) defines air conditioned or heated space within a home as the home’s “envelope” or the “thermal envelope.” According to BPI, the optimal amount of air that should move through your home is .35 air changes per hour at 50 paschals. 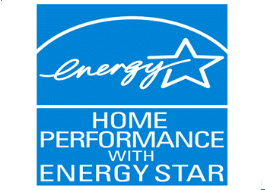 If your home isn’t tight enough, you are wasting energy and likely paying too much on your utility bills. This is because you are having to pay to condition air that is being pulled through the cracks and imperfections in the home’s thermal envelope. You have more even distribution of heat with less drafts and fresher air. Safety is King! If your home is below .35 air changes per hour at 50 paschals, your gas appliances and furnace can draft improperly creating serious safety issues for fire and carbon monoxide poisoning, as well as trap unhealthy chemicals in your home from out-gassing. A home that is testing too tight can cause "sick house syndrome." 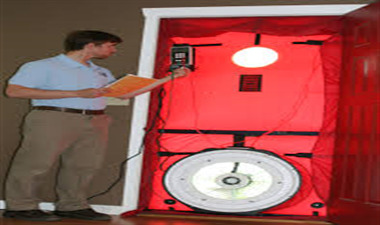 A simple blower door test can determine if you home is breathing properly. In leaky homes, the air is frequently being pulled from the attic (or crawl space) where air has been contaminated with dust, dirt, and animal feces. 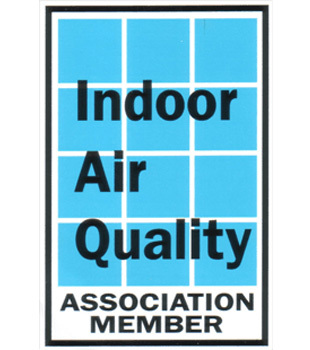 Too much air from the outside also contributes to increased allergens, pollen, and dust in the home. Moisture problems can lead to mold and damage. The auditor will need to close all exterior doors and windows, open all interior doors, and close any fireplace dampers, doors, and wood stove air inlets. There are two approaches to Air Sealing. Both are effective, but like most applications there is better and a best. Ideally, the insulation is removed then the technician can easily see to seal the top plates of the walls from the attic. While this approach is more costly, it provides the best resistance to air infiltrating from the attic into the living space. Although the top plates are sealed, it is still very important to address the interior of the home to assure that any combustion appliances are in sealed closets and other weatherization measures are properly addressed. 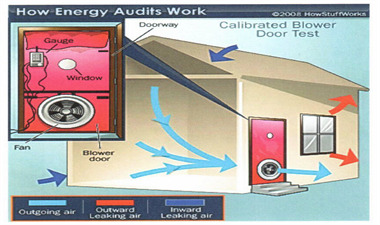 Blower door technology is used to optimize and locate otherwise difficult areas that need sealing. A home can be effectively sealed without going into a home by a skilled technician utilizing a blower door, caulk, weather stripping, foam, and effectively isolating the combustion area appliances from the living space. In all cases, the technician will be working to achieve the closest to optimal without going under the recommended air changes per hour. In existing homes, it is difficult to achieve optimal, but a skilled technician knows how to get it as close as possible without going under.